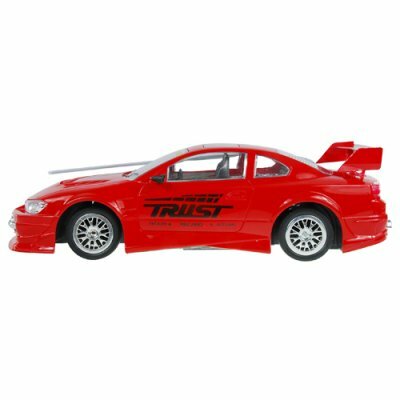 Successfully Added Radio Control Red Speed RC Racing Car (220V) to your Shopping Cart. Radio Control Red Speed RC Racing Car is everything you want from a remote control racer and more! This racing car lives up to its hot red image. It's a terror on wheels and comes in a true scale ratio of 1:16. While it doesn't take up too much space it is still big enough for some serious toy racing. Equipped with a spoiler and racing rims for that professional racing look, it tears up the streets in style! Utilizing a 8-directional remote controller, two thumbsticks provide forward and reverse throttle, along with left and right directional steering. Responsive and quick, it'll provide hours and hours of fun and excitement. This RC toy is also a street racer's dream come true with replica nitrous oxide (NOS) tank where backseats should be. It's a handy weapon to have when you want to suddenly distance yourself from pursuers. No detail has been overlooked as the car comes with a drifting handbrake for Japanese style racing. Two inline power amps and three earsplitting sub woofers complete the package for a ride you'll be proud to own. Take advantage of this great deal and re-sell on eBay, Amazon, uBid, or your own physical/internet store. Chinavasion's factory-direct prices let you buy more speed for less dough. The default charger for this product is for 220V. If you need a 110V power adapter then order CVGQ-T24-110V. What is the wheel adjustment for? The wheel adjustment will help you straighten the front wheels, as time can cause wear and tear. This way you get much more longer use out of this durable and amazing RC racing toy car for years to come.